Doll has never been removed from box, however, exposed surfaces have faded slightly from exposure to sunlight. This doll is made in the same scale as the talking Pee Wee and would make a great display for your collection. 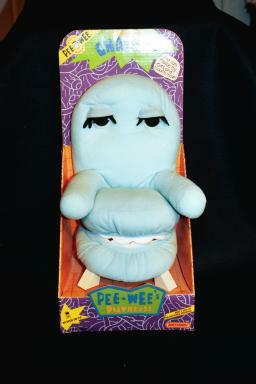 Pee Wee loved to take flying leaps onto Chairry after jumping out of the Magic Screen. Website design and hosting by Sohodojo Business Services. Item 275 of 466 items displayed in viewer. 0 items in cart.